Last May, Kojima Productions launched a teaser site with either a "S" or a "5". It was a number "5". And it belongs to Metal Gear Solid: Peace Walker. 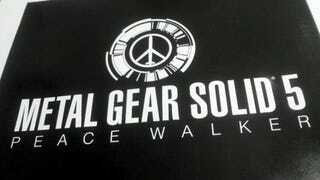 According to Konami spokesperson Jirou Oishi, Peace Walker was named Metal Gear Solid 5 during the planning stages. These are concept logos for the game. Peace Walker no longer carries the "5", but for Konami, the title lives up to its the number. "This game is an MGS5-class game," Hideo Kojima stated in July 2009. "I am supervising, designing, producing, directing, and editing this title together with the MGS4 team." Kojima On Peace Walker: "This game is an MGS5-class game"
Metal Gear: Peace Walker will be released on April 29 in Japan, May 25 in the US and May 27 in Europe. The game will require "hundreds of hours" to complete.